Mexico is a secular state with religious freedom and a strong separation between church and state. Most Mexicans are culturally Roman Catholic, but only 10% are regular churchgoers. Roman Catholicism was introduced when Spain conquered Mexico in 1521, but in many areas it was merely a veneer over native Mayan polytheistic religions, the two blending into a folk Catholicism typified by the sacrifice of chickens in churches to banish illness. In the 1960s, many people in the villages of Chiapas, the southernmost state, became evangelical Christians. They were seen as betraying their community, and the first evangelicals were killed. Later it became customary to forcibly evict them from their homes and lands and over 35,000 evangelicals were evicted in Chiapas over a 35-year period. This situation improved greatly in the 1990s. Christians in Mexico currently face persecution for two major factors: refusal to take part in traditionalist festivals and conflict with drug cartels. Persecution of evangelical Christians continues in rural villages in the southern states where Catholicism is often intertwined with native Mayan religious practices. Evangelicals refuse to take part in or contribute to traditionalist religious festivals because of heavy drinking and pagan elements, but traditionalists see refusal as a betrayal of the community and an attempt to undermine its culture. This leads to outbreaks of persecution in villages in Chiapas and also in other states including Hidalgo, Oaxaca, Jalisco, Guerrero and Puebla, where Christians face harassment, beatings, discrimination and eviction from their homes and villages. Local authorities often cut off basic services such as water and electricity if contributions are not made. Christians of all denominations face persecution from Mexico’s powerful mafia-style drug cartels which often threaten church leaders, targeting churches for extortion and to use as fronts for money laundering. Some pastors and priests have been kidnapped or killed and thousands face death threats and intimidation. As well as seeing churches as a revenue source, drug gangs consider them a threat because churches teach that that involvement with drugs is not compatible with the Gospel and some churches support rehabilitation programmes for drug addicts and alcoholics. In addition to these factors, there has been a complex case – the longest-running criminal case in Mexican history – in which a miscarriage of justice led to the imprisonment of a group of evangelicals in the Acteal region of Chiapas. “The Innocent of Acteal” were 79 prisoners, mainly evangelical Christians, from Chiapas, who were unjustly imprisoned in March 1998 on false charges of participating in the Acteal massacre in December 1997, when 45 people (mainly women and children) died in a violent gun battle. Lawyers for the men presented convincing evidence of their innocence and in 2004 the Office of the Attorney General recommended the release of most of the prisoners, but none was released due to local opposition. The men were eventually released in groups between 2009 and 2014, but they were not allowed to return to their homes due to fears of confrontation with local opposition groups. The state government promised to provide housing and employment for the released men, but permanent housing took years to materialise. From the mid-1990s, Church in Chains engaged in dialogue with the Mexican Embassy in Dublin on behalf of the Innocent of Acteal, sent aid to help the families of the prisoners and organised letter-writing and postcard campaigns. 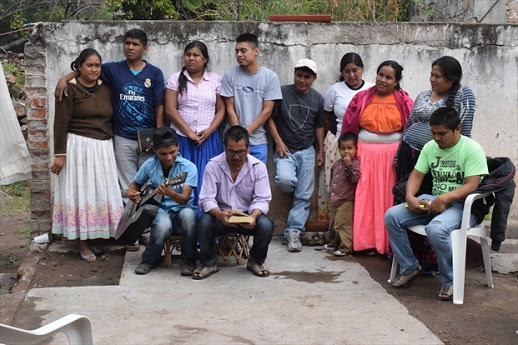 Among the many evangelical Christians driven from their homes in 2016 were an extended family of sixteen who lived near Las Margaritas in Chiapas. On 13 November 2014, three of the remaining five Acteal prisoners were released from Amat√© prison in Chiapas state. On Wednesday 10 April, the Mexican Supreme Court sitting in Mexico City ordered the release of 15 of the “Innocent of Acteal” group of prisoners who have been imprisoned since March 1998. The 15 men were released from Amat√© prison late on Wednesday night and taken to Tuxtla Gutierrez, the state capital of Chiapas. Their families have travelled from their homes in remote villages to Tuxtla to greet them. Seven more of the Innocent of Acteal group of prisoners have been freed from prison. The men were released earlier this month following a decision of the Mexican Supreme Court.